The national flag of Honduras was created during the Administration of the President of the Republic Mr. Jose Maria Medina on February 16, 1866, when the National Congress issued Legislative Decree No. 7, which states. “The national flag of Honduras will carry, like the one of the old Central American Federation, two blue stripes and one white in the middle, placed horizontally, and, in addition, a group of five blue stars with five protruding angles, in the center of the white field. The national flag of Honduras is three to 3 feet long and two feet wide. 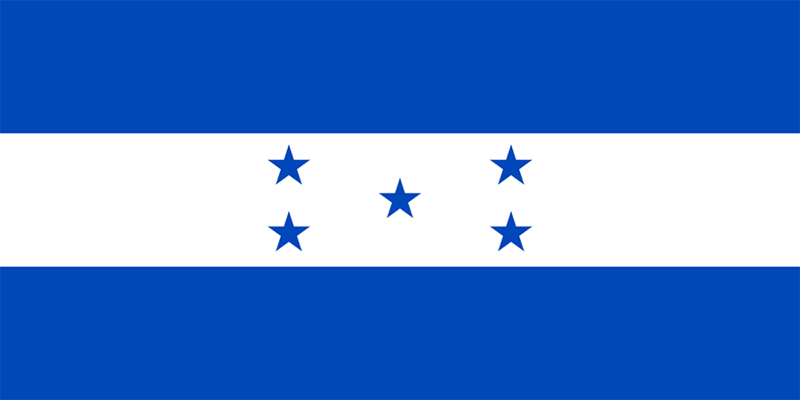 “The National Flag of Honduras shall consist of three equal stripes And horizontal, upper and lower turquoise blue, the center of the white and will carry in half five stars of five angles protruding the same blue, forming with four of them parallel to the stripes, the rest being placed in the center The width of the set of three strips shall be contained twice in the length. The blue stripes represent the Honduran sky, the Atlantic and Pacific oceans that bathe the coasts of the national territory. It also symbolizes justice, loyalty, fraternity, strength, sweetness, courage, brotherly love and the generous ideals that unite the Hondurans. The five blue stars symbolize the five countries that formed the old Central American Federation and the ideal of the union of Central America. The white stripe means purity, integrity, faith, obedience, peace, steadfastness, vigilance, kindness and nation. On May 23, 1995, as President of the Republic Carlos Roberto Reina, through Legislative Decree Number 84-95, the National Congress declared September 1 of each year as National Flag Day. From that year, on that date all State institutions, civil and military, as well as citizens in general, should pay tribute of veneration and respect to the Flag of the Motherland.